Wood Dale, IL – MC Machinery Systems, exclusive dealer of the LUMEX Avance-25, will present the powerful platform at the upcoming RAPID event, May 18-21 in Long Beach, CA. 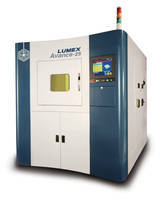 The LUMEX Avance-25 combines laser sintering and high-speed milling in one and can be seen in action at booth #638. The LUMEX Avance-25 metal laser sintering hybrid milling machine is the only machine in the world which relies on one-machine, one-process manufacturing of complex molds and parts by fusing metal laser sintering (3D SLS) technology with high speed milling technology. The machine enables production of complicated parts through total manufacturing by digital engineering, using 3D data. The machine achieves the highest accuracy in part fabrication since metal powders are melted and sintered via laser, while surfaces are precisely milled at high speeds. Dies and molds with very complex geometries can be fabricated in one piece with high accuracy, shortening lead time and reducing manufacturing costs to a half or even a third of conventional methods. Also, 3D cooling channels can be incorporated into molds in the single setup, thereby increasing cooling efficiency and enabling high-cycle injection molding with better than ever quality and precision, reducing costs and improving efficiency. Differentiated original parts production with internal structures, thus far considered impossible, are feasible on this machine. What's more, this metal laser sintering hybrid milling machine is capable of quick turn production of custom parts, whether prototypes or small production run parts.